Positioning is vital when caught in one of Fortnite’s many gunfights. Getting the higher ground or flanking an unsuspecting enemy can be the key to another kill notch on your belt. While characters alone are pretty mobile, the bounce pad can give you some serious help when moving around the battlefield. 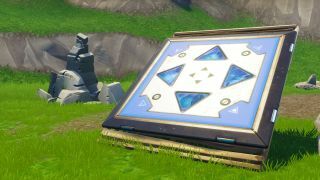 The Fortnite bounce pad is the blue square pickup similar to the spike trap or fire pit, it can be used to get extra air, disorient opponents, or reposition yourself while fighting. It causes no fall damage when used, even when you go a few stories up, so it's helpful in getting places others wouldn’t expect you in. Gunfights almost always end up with all kinds of buildings built on both sides of the field, players quickly build up walls and towers before direct shots can be landed. Use the bounce pad to counteract this by placing it on a slanted platform, it’ll launch you directly over the enemies wall and give you a big of float time too-- so you can fire off a few aerial shots before hitting the ground. You can also build up tower and use the bounce pad to launch off the very top giving you even more air, and you still won’t get hit with any fall damage. Heights are all the rage across the map, they’re the key to getting the drop on opponents and make it easier to watch your own back. But nothing sticks out more than a bunch of wooden ramps and walls that let people know that you’re hiding out in that tower. The bounce pad solves that problem and can inconspicuously get you to the roof of that three story building easily, leaving little trace behind to distant pedestrians. Simply place the pad on the ground, sometimes you’ll have to build a platform since it may not be flat ground, and jump on it. Most times when I see a bounce trap I just have to jump on it, it’s something of habit and I know a lot of other players are the same. It’s good to use that habit against players and setup up a spike trap where they’ll land. If you’ve got two spike traps, or even one. Place the bounce bad on a wall so when they jump on it it’ll launch them directly between two spikes of death.